This right facing, ¾ profile portrait is one of a pair of miniatures of Thomas Laycock and his wife Isabella (nee Bunker) which are believed to have been painted in England in about 1811. It shows the newly-promoted Thomas Laycock in the uniform of the 98th Regiment a foot; Laycock had received his promotion to the rank of captain on 27 September 1811. Laycock is clean shaven, his dark brown hair stylishly is coiffed, left longer and curled on top, and brushed forward over the temples. At this time all British infantry wore red woollen jackets. Officers’ jackets (as shown in this portrait) were made of a bright scarlet cloth, well-tailored and close fitting, often padded to exaggerate the outline. The uniform jacket of the 98th Regiment a foot was brass-buttoned and double-breasted, with button-back lapels, white facings and stand collar; the practice of distinguishing regiments by different coloured facings had been in general use since the early 18th century. The jacket is worn with a black neckcloth, a tasselled gold epaulette at the shoulder denoting the rank of captain is fastened over a white cross belt with the regimental insignia (98) clearly displayed on the cross-plate. 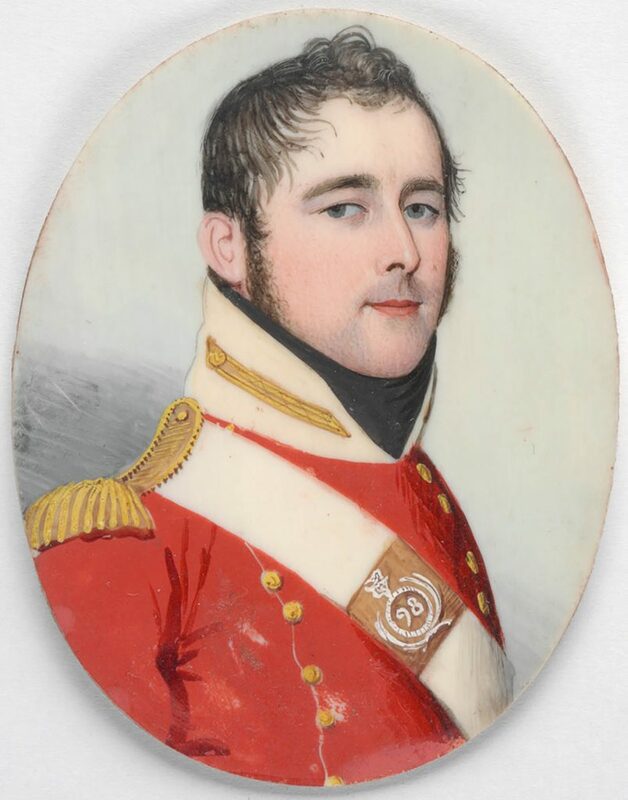 Thomas Laycock (1786?-1823), soldier and explorer, was the son of Thomas Laycock (1756?-1809), Quartermaster with the NSW Corps, and his wife Hannah (1758-1831). He came to Sydney with his mother on the Gorgon in 1791. He entered the New South Wales Corps, was commissioned as an ensign in December 1795, and promoted lieutenant in 1802. After serving at Sydney and Norfolk Island, he was made Quartermaster at Port Dalrymple in 1806, under Captain Anthony Fenn Kemp. Laycock later returned to Sydney where he became the only casualty in the January 1808 Rum Rebellion; while searching Government House Laycock fell through a manhole onto his ‘principal joint’. On 1 June 1809, Laycock married Isabella Bunker, daughter of Eber Bunker. Following Governor Macquarie’s arrival six months later, the newly married Laycocks departed for England, sailing aboard HMS Dromedary on 18 March 1810. After serving in the American war of 1812, Laycock sold his commission, sailing for Sydney with his wife and two sons aboard the Fame. Leaving on 8 March 1817, Isabella took ill during the journey and died suddenly at sea on 12 May 1817. Left with two young children to raise, Laycock was quickly remarried to Margaret (née Connell) on 8 July 1817, at St. Philips Church, Sydney, with whom he had a further two children.